About a week ago I purchased a wonderful French cookbook from a discount bookstore and I have spent this entire week perusing the glossy pages and getting lost in my imagination. The dishes look gorgeous, even though some sound daunting to make. It has been an absolute pleasure turning over pages, each one presenting a more fabulous picture than the last. So today, feeling extra confident to attempt the first few recipes, I got down to making some cauliflower soup. The recipe looked simple and the ingredients were readily available. Did not want to spend too much time making dinner because I also had a carrot cake to bake for the office meeting tomorrow. I don’t usually take a recipe as a whole and execute it in it’s entirety ~ I read up at least 3 to 4 versions of it before I start ~ and this is no different. Apart from this new cookbook I also consulted James Peterson’s Cooking and www.taste.com.au (of course). Both James Peterson and Taste.com.au use potatoes in their soups and I liked that idea. 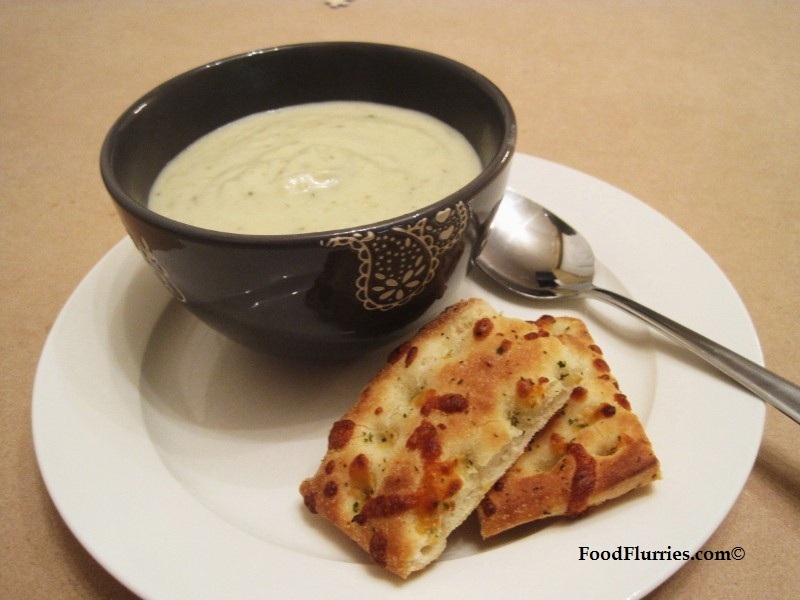 According the Peterson, cream is essential in cauliflower soups to balance out the more “aggressive flavours” of the cauliflower. He also calls for the transferring of the soup to a clean pot after pureeing (uuugh!) and to use a strainer while doing this (double uuugh … who has the time?!). I conveniently skipped this part coz I wasn’t serving guests, and anyway I like more rusticy soups. Oh! Speaking of which, at some point I must attempt to make Minestrone soup. I have only ever eaten the canned stuff, so I am expecting the ‘made-from-scratch’ version to be a whole lot better. *Makes note to self to make Minestrone soup. Anyhoo, this month calls for lots of soup experiments and I intend to take full advantage of it. The sun sets at 4:30 pm here! And for the past few days it has been so foggy I can’t even see my neighbour’s house across the lawn! As a consequence though it has helped keep the temperatures from falling below zero …. so far. On days like these I am relieved that I can cook, otherwise R and I will have to be at the mercy of supermarket soup merchandise. 1. Heat some oil in a heavy bottomed pot and sautee the onions for 2-4 mins until soft, but not coloured. Then add the butter and sautee the celery and parsley. 2. Once fragrant, add the chicken stock, milk and cream. Stir to combine. Then add the potatoes and cauliflower to the pot. Bring up to the boil, then lower the fire and simmer for 20 minutes. 3. Sprinkle in the thyme and stir to distribute. Taste for seasoning and adjust accordingly. 4. Take off the pot from the stove and either pour the contents into a food processor or use an immersion blender to blitz. The mixture will thicken considerably due to the potatoes, so if this happens then thin with extra milk or stock. 5. Return the soup to the stove to heat through (do not boil). Check for seasoning again and then serve with crusty bread or croutons. Enjoy. If you like you can garnish with chives or a sprinkle of freshly ground nutmeg. Before I depart, here are some Cauliflower facts. – Cauliflowers were introduced in France in the 16th century, by means of Genoa. They kinda hung around for a while on the back burner and did not really feature very prominantly until the reign of Louis XIV. – Cauliflowers come in white, orange, green and purple. – Eating cauliflower on a regular basis may reduce the risks of prostate cancer. hmmm… and i thought i was a genius when i threw in potatoes in my mushroom soup… sigghhhh… which i think you should try… its yummeh… might have to sedate R first..